I have written this article to review and compare the best online PMP Certification Training courses. A PMP certification aspirant needs 35 contact hours of project management education to write the credential exam. An online PMP exam prep course is the cheapest and most flexible way to complete this requirement. These courses are also called self-learning or on-demand PMP training programs. There are tens (if not hundreds) of such online classes available on the Internet today. You have to be extra careful while investing in such a program since all of them are not equal. A bad choice can spoil your chances of success in the exam. Don’t worry! I have done a thorough & careful analysis while researching and reviewing the top PMP certification training programs. By the end of this article, you would know the best online PMP course. 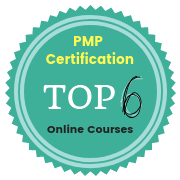 As the name suggests, PMP online training courses are delivered over the Internet. These courses are very different from boot camps or live online programs. They do not follow a definite schedule and are not taught by an Instructor. As a student, you just buy the training course and start studying on your own through online videos and other eLearning material likea audios, presentations, practice tests, and workbooks. Note: You should read my other article on review & comparison of online PMP boot camps if you are looking for a live online class. Are The Videos Done By A Native English Language Trainer? LMS Yes. Good. Yes. Very good. Not Available Yes. Very good. Yes. Good. Yes. Very good. Chapter End Quizzes Yes Yes Yes Yes Yes Yes. With Rita’s Book & Fastrack subscription. Tips & Tricks Yes. As part of the course and through weekly newsletters. Yes. As part of the course. Yes Yes. As part of the course. Yes. As part of the course. Yes. As part of the Rita’s book. What Is The eLearning Access Duration? PM PrepCast is available in three variants – Basic, Elite & Executive. PM PrepCast Executive is the most expensive of the lot as it includes coaching sessions with an instructor. PM PrepCast Elite is a combo product that includes PM PrepCast Basic, PM Exam Simulator (1000+ practice questions), and a few other exam prep products as detailed in the table above. PM PrepCast Basic is a regular online self-learning course. Brain Sensei course is completely different from the other programs. It is extremely easy to grasp the PMBOK Guide concepts as the topics are taught Process Group wise. It comes with a 100% pass guarantee. PMTraining program includes number of study aids. It has almost everything except for the final simulation tests. These can be bought separately for a special price of USD 49. Simplilearn’s course is priced differently in different countries. You can check the price in your country by clicking here. It is available at special discount on this blog. Velociteach’s course is also available for 1 month & 6 months access for USD 219 and USD 499 respectively. I have considered 3 months access for comparison, which is available for USD 349. RMC’s program is also available without 35 contact hours certificate for only 3 days of access at USD 288. Technology Aids – I would have given a 5 star rating if the providers were giving a fully-featured Learning Management System (LMS) and a mobile app. There is something or the other missing in each program. Hence, I have given a lower rating of 4 and 4.5 depending on the quality of the LMS and availability of the mobile app. Study Assistance – I have given the rating based on the quantum and type of support given by the providers. Access Period – I think 90 days is more than enough to prepare, study and pass the exam. Nonetheless, I have given 4 star rating for 90 days or 3 months access and 5 star rating for more than 90 days access. Content Quality – I have given rating on content quality after critically reviewing the videos and other study material. I have not considered pricing, refund policy, and pass guarantee while arriving at the ratings as the programs should be compared on the technical factors like quality & content. In my opinion, pricing should not influence the rating. Moreover, everyone’s budget is different. However, you should consider the price before taking the final decision. The PMP certification is an expensive affair. The training cost is one of the major component of the total certification cost. You should choose your training course judiciously. A good training could improve your chances of success whereas a bad one can lead to the failure in the exam. We have reviewed top 6 courses but you need only one for your exam prep. It is very difficult to choose one out of the six as some of them are evenly matched. So, let us start by eliminating the ones that are not worthy of investment. RMC is an established brand in the project management training industry. Its offering is popular but it has not fared well in our comparison. Some aspects of RMC’s program is very good, but its overall rating is low. Moreover, in my opinion, RMC’s progra is obnoxiously priced. You can buy a good PMP Instructor Led Training Course in this price range. I would not recommend you to buy this program. Let’s talk about the other programs. All of them have almost equal rating in our comparison but each one of them has its own advantages. You can buy any one of them based on your unique preferences. Let me elaborate a bit. Cornelius Fichtner is renowned educationist and well respected figure in Project Management training industry. Every year thousands of aspirants successfully pass the exam by studying from Cornelius’ training material. He is the founder of his company and the creator of many exam prep products. Among all courses, this course is most reasonably priced. It has got the highest rating in our comparison. The best part is that you can download all the videos. If you decide to invest in this course, then I would recommend you to buy in PM PrepCast Elite as it offers better value than the Basic variant. The Elite variant is price at USD 299 whereas the Basic variant is priced at USD 229. However, the Elite variant comes bundled with 1600+ practice questions PMP Exam Simulator. The Simulator is separately priced at USD 129, but you would save $59 by buying it as part of PM PrepCast Elite. Brain Sensei’s course is completely different from any other program that I have seen. It teaches the PMBOK Guide’s topics Process Group wise. This is really helpful in understanding the the project management concepts. The topics are covered as part of a long story, which makes the course very engaging. You never feel bored. The lessons are interspersed with small quizzes & exercises that validate your learning as you go along. This course comes with very few study aids. You would need to buy Kim Heldman’s study guide to complement this course. It is more expensive than the other choices presented in this article but it is worth the price. Christopher Scordo is a well known personality in the Project Management training industry. His book (PMP Exam Prep: Questions Answers & Explanations by Christopher Scordo) is one of the best selling books for the exam prep. He is the founder of PMTraining. This course offers the more study aids than any other course. It is almost complete in all respects. But you would need to buy extra practice questions to complement this course. Simplilearn is a professionally managed company that offers slew of courses. They provide professional studio quality videos, very good study material and excellent support. It is an expensive course but the price becomes reasonable because of the exclusive discount coupon available on this blog. If you are looking for a big and well-established brand then you can invest in Simplilearn’s offering. What are the key factors or attributes that makes a self-learning PMP online training course good? What are the things that you should look out for before enrolling in such a course? Here is a list of key parameters that are must for a self-learning online course. Registered Education Provider (REP) – This is not an essential feature of a online PMP course, as a non-REP can also also issue a 35 contact hours certificate. However the certificates issued by a REP are pre-approved by PMI. Since the PMP certification exam is a difficult exam, one should be careful and take online PMP course from a REP only. 35 Hours Certificate – Many training providers give access to the online training material but they do not issue the 35 contact hours certificate. Since this is a mandatory certificate for appearing in the exam, a training course is useless without it. Native Language Trainer – The exam is conducted in English. It is extremely useful to learn from the content that has correct English grammar and idioms. The online videos and the other content should be prepared by an trainer whose native language is English. Technology Aids – The availability & quality of Learning Management System (LMS) and accessibility of eLearning material over mobile devices are very important for an on-demand program. LMS keeps track of your learning progress and learning through mobile devices can save a lot of time. Study Aids – A PMP online course should provide additional study material besides the video and audio content. The video and audio content is good for understanding the concepts, but actual learning comes from practice tests, downloadable workbooks, formula guide, glossary etc. Study Assistance – Many courses provide study support through emails, private forum discussions, and webinars; while some others do not provide this feature. Since you are studying on your own, this is a crucial feature to clarify the doubts. You might feel lost in the absence of such a feature. A PMP online course should provide such a feature. Access Period – I believe duration of access period for eLearning course should not be less than 90 days. I think 90 days is more than enough to prepare, study and pass the exam. Refund Policy – You may need to get refund of your money in an exceptional circumstance. Most providers have some sort of refund policy.